Annual Conference in Orlando, this past February. KLAS Research, based in Orem, Utah, has an extremely important mission statement; “Our mission is to improve healthcare technology delivery by honestly, accurately, and impartially measuring vendor performance for our provider partners”. KLAS is an independent research firm based in Orem, Utah; established in 1996. KLAS is similar to Consumer Reports, only for Healthcare IT. They conduct over 30,000 interviews per year with healthcare providers to gain qualitative and quantitative data on over 1,000 healthcare IT products within 100+ healthcare IT market segments. They maintain an active database of rankings, performance scores, alerts and blogs to provide vendor transparency to providers on existing technologies. Similarly, a very key part of The Emily Jerry Foundation’s mission statement is “identifying technology and best practices that are proven to minimize the human error component of medicine.” This is where I saw that both of our organization’s core goals and objectives are in perfect alignment, in striving to always be an active part of the solution to improving healthcare. I was contacted by the KLAS team, a few months ago, as they were in the process of beginning research on a comprehensive study covering intravenous (IV) compounding technologies that are currently available from various manufacturers. It is absolutely imperative that this vital “life saving” technology be evaluated objectively in an unbiased manner. This is precisely what KLAS does and exactly why The Emily Jerry Foundation is looking forward to establishing a very long, mutually beneficial, relationship between our organizations! On the Road to Saving 440,000 Lives a Year! On March 1st of 2006, Emily’s mother and I had to make the most difficult decision of our lives, which was to take our precious 2-year old girl, Emily, off of life support after a preventable medical error. In horrible, unimaginable situations like this, we all respond differently. However, as any father would be, I was completely and totally devastated emotionally. Even with that thought in mind, I still never questioned the existence of God. From that horrific day forward, I knew in my heart that He had to have a plan, I just had absolutely no idea, nor was I ever meant to even comprehend at that point, what exactly God’s plan was for my beautiful little girl’s short life here on earth. As I frequently mention in many of my speaking engagements and lectures, as Emily’s father looking back over the past eight years, I have really come to believe that Emily’s short life was truly meant to save thousands from the same fate. In retrospect, I am also convinced that Emily’s life was actually meant to be the catalyst for all the positive change in attitudes and opinions on preventable medical errors and how the medical community responds and learns from them. This is precisely why I have always strived with my advocacy efforts, as well as, the programming of The Emily Jerry Foundation to be an active part of the overall “solution” to preventable medical errors, which by recent estimates are claiming more than 440,000 lives every year and are now sadly the third leading cause of death in the United States. 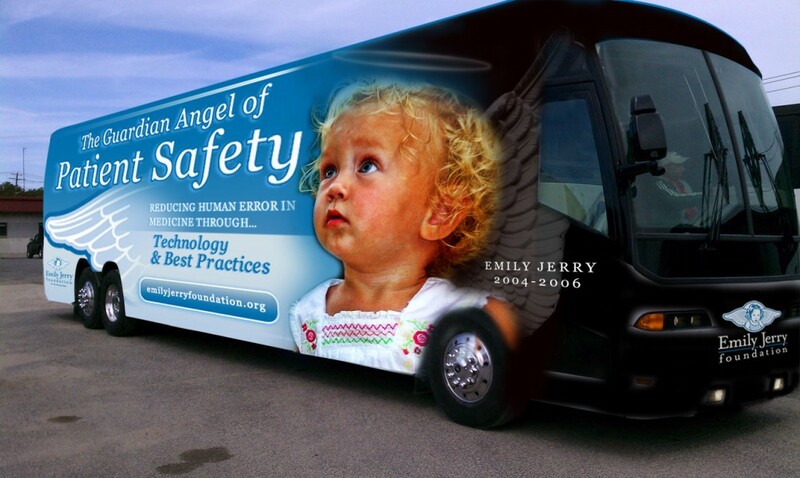 I am extremely pleased to say that the special Guardian Angel logo for the foundation, designed with Emily’s likeness, is very quickly becoming the “Gerber Baby” of patient safety. Most everyone in medicine and pharmacy recognizes it. More importantly to me, they really seem to comprehend the fact that it stands for all of this positive change that is, in fact, occurring in the underlying “culture of medicine” and how it’s being practiced, both here in the United States and abroad. In these ways, Emily lives on, and is truly responsible for saving many lives. My goal is to keep the momentum going forward and continue to inspire those in the medical field to never settle for “good enough” when it comes to patient safety. When I first established The Emily Jerry Foundation, under these distinct premises, my primary motivation was to begin getting out and speaking to as many caregivers around the nation as possible. I wanted to share with them Emily’s story and the extremely important lessons that have been learned since her passing. My feeling was that the caregivers, hospital administrators, boards of trustees for medical facilities, etc., were the ones who could really impact the changes I was praying for, more quickly than anyone else. Over the past three years, I have been blessed with the opportunity to speak before tens of thousands of people, all who play an integral part in patient safety in our healthcare system. I have already given more than 75 lectures, keynotes speeches, and presentations on patient safety and ways to reduce preventable medical errors at hospitals and medical conferences around the nation. It is extremely important to keep this wave of enthusiasm for our very important cause moving forward. This is precisely why I believe so strongly that The Emily Jerry Foundation needs to continue to reach and convey our vital messages to as many caregivers and healthcare administrators across the nation, as quickly and effectively, as possible. According to the American Hospital Association (AHA), we currently have 5, 723 registered hospitals in the United States today. I know it’s a completely unrealistic goal to expect to be able to book the speaking engagements and patient safety symposiums, which have proven very effective over the past few years, at each and every single medical facility in our nation. 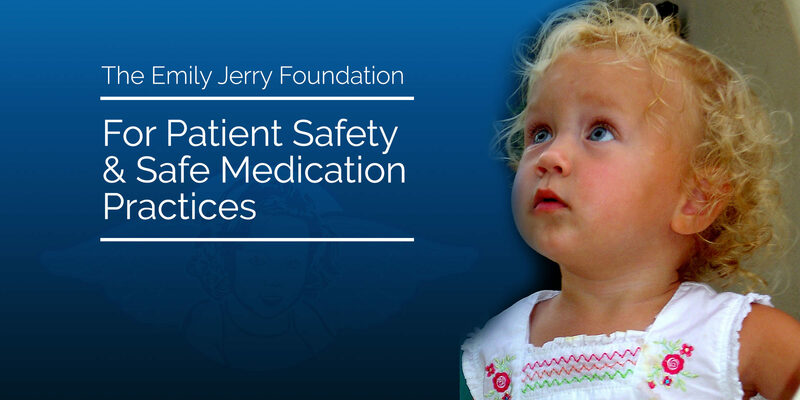 This is exactly why we have developed The Emily Jerry Foundation’s new “Patient Safety Express” Educational Program, to effectively and efficiently reach, as many of these hospitals, as possible. My plan is simple. If we can raise enough funds and donations to either purchase or lease a coach tour bus, similar to the one pictured above this article, I am going to make a personal commitment to our cause to live on the road for 12 to 18 months at a time, going to as many hospitals and patient safety functions around the country as humanly possible. Typically, I am only able to conduct roughly two to four speaking engagements and patient safety events per month via commercial airlines. With the “Patient Safety Express”, I will be able to more efficiently cover the entire United States visiting three to five hospitals per week. My very realistic goal then, subsequently, becomes approximately 156 to 260 hospitals and functions per year! Please join me in this fight by donating toward this very important educational program and our vital “life saving” cause at emilyjerryfoundation.org/donate. If you would like to discuss corporate sponsorship for this program, please contact me directly at chris@emilyjerryfoundation.org. As I posted last month, I was incredibly thankful to be interviewed for Part 1 of Emily’s Story on Mark Graban’s LeanBlog.org. If you are new to the site or missed that episode, click here to listen to Part 1. Mark recently released Part 2 of our conversation which covers many topics including: overhauling systems vs. blaming individuals, pushing for a comprehensive national Pharmacy Tech policy, Public forgiveness of Eric Cropp, and much more! Click here to listen to Part 2 of my interview on the LeanBlog.org Podcast. Mark’s blog is a great place to learn innovative information about best practices in medicine so please share with your network. As always thanks for your continued support!